After a year of restructuring and streamlining, McDonald's has a new mantra for its initiative. The company on March 10 filed a U.S. trademark registration for the phrase "The Simpler the Better." But it's not yet saying what plans it has for this adage. A company spokesperson told BurgerBusiness.com, "We routinely file intent-to-use trademark applications as part of our regular course of business. We can't share details at this time as to how this trademark may or may not be used." The phrase may be no more than a lifestyle slogan for use with spring/summer foods and beverages marketing and advertising. In San Diego, McDonald's is testing a "Simple Delights" menu of items with 300 or fewer calories. Or it may be used with store operations. McDonald's has spent the past year trying to simplify its operations as CEO Steve Easterbrook reshapes it into his vision of a "modern, progressive burger company." That began May 4, 2015, with his reorganization of its global business structure into four segments. He called for in-store operational simplification as well, saying the company's turnaround would rest "on the fundamentals of executing, doing fewer things better with more material impact globally." The chain has worked to simplify its menu--although not returning to the very simple menu (above) with which it began--with mixed results. 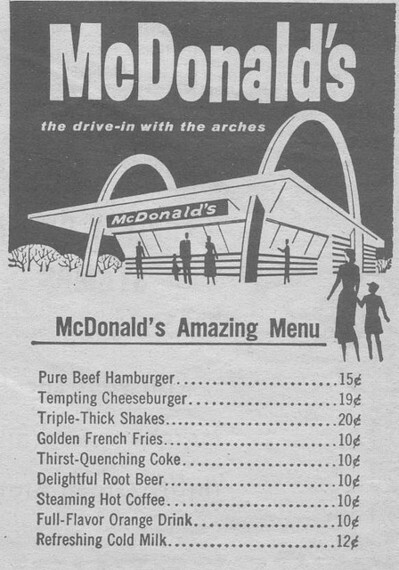 It eliminated its Angus burger line and the fancier versions of the Quarter Pounder with Cheese. But add-ons like the Bacon Clubhouse burger and short-term Sirloin Third Pound Burgers have led some franchisees to complain that the menu remains too large. In Nomura restaurant analyst Mark Kalinowski's franchisee survey last October, one operator lodged this complaint: "Oak Brook suit promised to simplify the menu. It has not happened. Customers are abandoning us in droves because we are either too slow or subpar quality." The success of the All Day Breakfast platform brightened franchisees' spirits, as evidenced by more positive remarks about their business. But in the Jan. 20, 2016, Nomura survey, one franchisee warned, "We did not simplify the menu and operation before we added All Day Breakfast. That's a big mistake that will hurt us long-term." So McDonald's remains in search of ways to simplify where it can. It is testing a simplified version of its Create Your Taste customization platform that has gone through several names but now is called "Signature Crafted Recipes," a term it also has trademarked. Along with that menu, McDonald's is testing table service in San Diego. It's true that McDonald's files for trademarks on names or phrases it ultimately doesn't use. One such term is "McBrunch," which it trademarked in 2014. In 2012 it registered "McCruncher," which it used here briefly to test a $1 burger and now uses in Ireland for a budget burger topped with crispy onions.